Gambling of any sorts is unlawful in Pakistan, yet many have seen and heard punters from all over the country, take risks and bet a huge amount of money on cricket. We have had our share of maverick cricketers, who not only took chances on the playing field and came out triumphant more often than not, but also indulged in taking risks off the field. The cricketing world finds our brand of cricket exciting due to its impulsive nature. Yet, ever since the trios of spot fixing Pakistani cricketers were exposed, there has been a dearth of unpredictable actions, arcane simplicity and downright dullness being associated to Pakistan cricket. A Pakistani cricket fan is used to high octane action on the field, and there is still plenty of that as long as Shahid Afridi is around in the limited overs international. 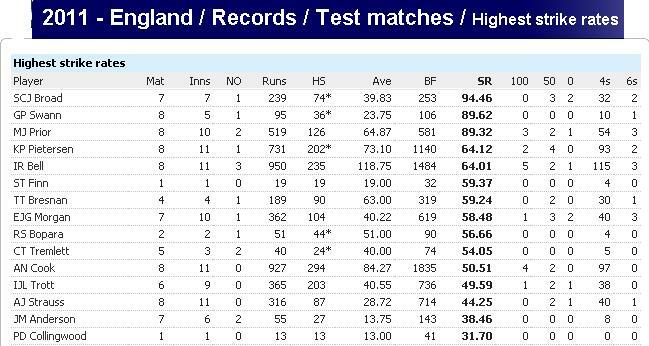 But, there has been a visible lack of positive intention from our test batsmen over the last 12 months or so. 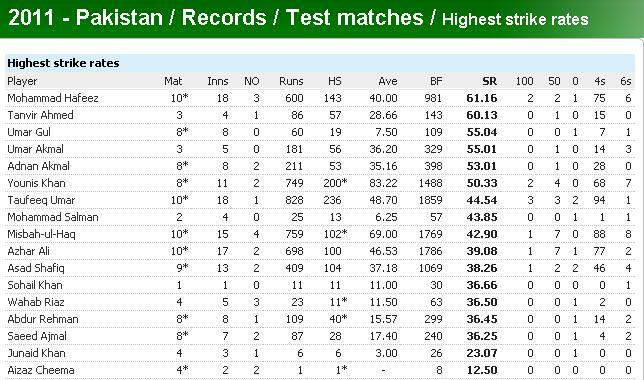 Nobody can argue the solid results under the leadership of astute captain Misbah ul Haq, but the batting approach against lower ranked teams leaves a lot to be desired. Now I am no adrenaline junkie (it is desired at times though), but using a more positive batting approach will actually help the test team in order to win against quality opposition. Whilst batting has been solid, it is our bowling which has allowed Misbah’s men to have a winning record ever since he took over. Our first test win this year, against New Zealand was courtesy of our bowling line-up which bundled up the wafer thin New Zealand batting line for a 110 in their second innings to secure a win in 3 days. Whereas the second test against NZ, where both teams batted under the RR of 3 in their first innings, and our bowlers could not wrap up the opposition for less than 250, ended up as a draw due to the safety first approach (nothing wrong with that) by batting at a RR of 2.45. Pakistan’s only test loss came against the first test during the tour of West Indies on a tricky pitch, where once again our bowlers were superb, but the batsman failed to raise their game up a notch against a virtual minnow and were un-successful in chasing a modest total of 219. Pakistan scored a grand total of 160 and 178 in the two innings, both at a RR of under 2.50 – needless to say that Pakistan won the 2nd test and drew the test series after a much positive batting display where they piled up the runs in the second innings at 3.35 runs per over and restricting the opposition to less than 250 in both innings. The upcoming series against England will be an important moment in shaping up the legacy of Team Misbah, it could either make or break his reputation as the best captain Pakistan has ever had, after Imran. I recently asked Pakistani cricket fans about the inability of Pakistani batsmen to score freely in test cricket, and whether this approach will be successful against a strong batting line-up of England. Most of them responded by saying that this conservative approach can be used to beat lower ranked teams, not the best team in the world. England has scored at a run-rate of 3.81 this year in test cricket, meaning that on an average, they have scored 342 runs in a day. Whereas Pakistan, have only managed to score 256 runs on average. 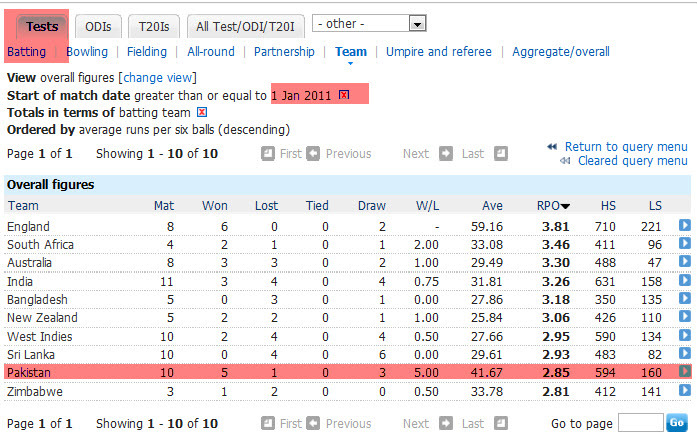 It is the second worst of all test playing nations, just beating Zimbabwe. Rotating the strike is one of the most undervalued cricketing ability in Pakistan. Not only does it keep the scoreboard running, it also helps release pressure and throws the opposition bowler off his plan. We might not appreciate it when batting against the likes of Shahdat Hossain, Lakmal or a Darren Sammy but come crunch time against England; their wily bowlers will use this shortcoming to exert pressure on our batsmen. And it is only a matter of time before it ensues into another classic collapse against a quality opposition. If you ask Misbah, he would tell you that he plays the game to WIN. While going berserk is not being advocated, but showing the hunger to win, being upbeat while batting and taking risks can bring no harm to Team Misbah. It is the only natural step; they have to take to reach the top and be truly worthy of being compared to the unpredictable yet exciting yesteryear teams of Pakistan.